Don Lutton came to La Cygne in the mid-1940s to manage the Champion Textile Finishing Company, a factory that made tents, aprons, and other products from cotton canvas. In his spare time, he would paint scenes on large canvas panels--many of which were backdrops for the circus or carnival. A favorite pasttime for the children was to watch Don paint. 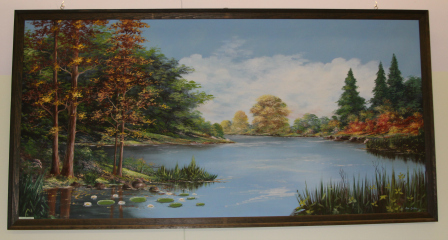 Don painted several pictures for La Cygne, including ones for the Christian Church and the Masonic Lodge. Three of his paintings can be viewed in the Swan Room at the La Cygne Library. Many others are among the collections at the La Cygne Historical Society Museum. On the hill east of La Cygne, a huge wire-mesh billboard beside what was then U.S. 69, featured scenes by Don Lutton depicting the birth of Jesus at Christmas, and the resurrection at Easter. Sadly, these paintings no longer exist, but a few photographs and slides of them still remain, including one photo on display at the museum.